In true Saints Row fashion, there is an insane amount of character creation options that lets you create the exact character you want. You could literally spend hours crafting your virtual self if you so desired or had the time. There are a near infinite amount of ways for you to customize your cars and wardrobe and even your hideouts. It’s seriously bonkers how much customization is available in this game. I thought Saints Row III had a ton of options, but it doesn’t even come close to the amount of stuff you can trick out in this version. The one thing that I did like about this version was the controls. Everything felt a lot smoother and easier to use. Truthfully the only time thongs got a little wild was when you were driving at high speeds. Your steering would get a little unruly as you tried to escape Zin and his minions. But other than that, I enjoyed the employment of the touch pad on the PS4 version for the prompted control scenes. It felt far more intuitive and comfortable to swipe your finger in one direction or the other than to try and button-match what pops up on the screen. But even if you don’t like that idea, you can set your game up from the very beginning to use either the touch pad or standard button prompt controls. So to sum it all up, if you are a fan of the series and feel like you need to get your jollies by picking it up for some giggles on your new PS4 or Xbox One, it’s familiar enough to be fun but it feels just like the last gen version. The gameplay is still there. The signature smart-assery is still there. And all the characters you have grown to love or hate have nearly all returned for this crazy alien-killing campaign. But sadly, this update wasn’t really much of an update, other than the fact that you can now play this game on the PS4 and Xbox One. The graphics feel last-gen, the addition of voice commands doesn’t really even warrant mentioning, and overall it still felt like I was playing the exact same game from the last gen systems. So if you still have your PS3 or XB360, keep playing SRIV on those systems. It’s just not worth the price of buying it again just to play the same game on your PS4 or Xbox One. I know it’s just an upgraded port to the PS4 and XBO, but frankly I expected a little more. Controls were solid and familiar but driving got a little wonky at high speeds. Had tons of audio issues and volume differences when using headset as well as on main TV screen. With the exception of adding super-powers, it’s pretty much the same old thing. 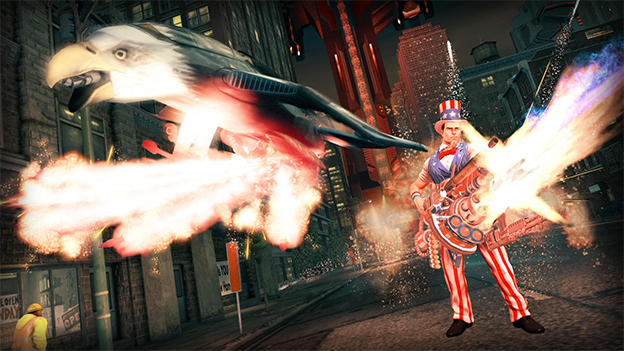 Ridiculous Amount of Content - Saints Row IV and Saints Row: Gat out of Hell on new gen consoles, both DLC mission packs, 25+ DLC weapons, 15 new vehicles, 60+ wardrobe items, 15 new homies to call upon and 6 new superpower elements. Over $80 worth of additional content total. 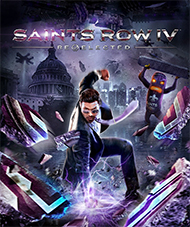 Don't Wanna Miss a Thing - Share all of the quintessential Saints Row IV moments - Zinyak singing Biz Markie, your first encounter with Paul, Saints of Rage, horrific plastic surgery mishaps, deaths by wub and general alien evisceration - with new generation screenshot, game clip and livestreaming tools. Voice of the People - Call in your homies for added firepower, select powers, navigate menus and give yourself a leg up on old Zinyak with integrated voice commands.